A jailed American Muslim leader and a Libyan intelligence agent have told U.S. and Saudi authorities they were involved in a Libyan plot to assassinate the ruler of Saudi Arabia, U.S. officials said Thursday. The allegations are viewed as credible by U.S. authorities but investigators are trying to determine if the plot was real and, if so, how far it advanced and whether Libyan leader Moammar Ghadafi was involved, according to two U.S. government officials. They spoke on condition of anonymity because of what they said was the sensitive nature of the case. The plot was revealed separately by Abduraham Alamoudi, an American Muslim leader jailed in Alexandria, Va., on federal charges of having illegal financial dealings with Libya; and by Col. Mohamed Ismael, a Libyan intelligence officer currently in Saudi custody. Both men have provided U.S. and Saudi investigators with detailed information about an alleged Libyan plot to assassinate Saudi Crown Prince Abdullah intended to destabilize the Saudi government, which has been beset in recent months by a series of deadly terrorist attacks by al Qaeda and other Islamic fundamentalists. President Bush has been briefed on the matter, which is being handled by the FBI, CIA, State Department and other U.S. agencies, officials said. Existence of the alleged plot was first reported Thursday by The New York Times and The Wall Street Journal. The accusations come at a sensitive time for Libya, which in December agreed to dismantle its biological, chemical and nuclear weapons programs. The United States in February lifted a ban on use of U.S. passports to travel to Libya and took steps in April to restore trade and investment ties with Ghadafi's regime. But the United States continues to list Libya as a state sponsor of terrorism and the alleged assassination plot, if true, could have a huge impact on Libya's efforts to achieve more normal relations with the United States. "We are very much aware of Libya's past involvement in terrorism. Ghadafi has pledged to end Libya's ties with terrorism, and cooperate with us and our allies in the war on terrorism," said White House spokesman Sean McCormack. "We continue to monitor closely Libya's adherence to this pledge." Alamoudi's statements were made during plea negotiations with federal prosecutors, who could recommend a lighter sentence if he is cooperative. Alamoudi, the former head of the American Muslim Council, has said that he met twice with Ghadafi in June and August of 2003 to discuss the plot, U.S. officials say. Alamoudi, who is being held without bond, has pleaded innocent to charges that he illegally attempted to funnel Libyan money to the United States. Prosecutors have also portrayed him in court papers as a supporter of the al Qaeda and Hamas terror groups, which Alamoudi has denied. Abdullah is the de facto ruler of Saudi Arabia; his half-brother King Fahd is technically in charge. King Faisal of Saudi Arabia was assassinated in 1975 by his nephew. In decades past, the United States government has itself tried to assassinate at least one world leader, Fidel Castro, a number of times. U.S. agencies also helped to foment coups in South Vietnam (1963) and Chile (1973) that led to the assassination of those countries' respective leaders Ngo Dinh Diem and Salvador Allende. Congressional reports have associated the CIA with plots to kill Congolese liberation leader Patrice Lumumba and Dominican Republic dictator Rafael Trujillo. 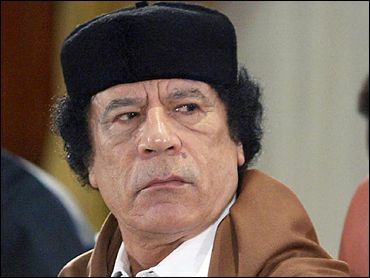 A U.S. air strike on Ghadafi's presidential compound in 1986 killed his daughter. An executive order signed by President Ford mandated that "No employee of the United States Government shall engage in, or conspire to engage in, political assassination."